The Legend of Tarzan is not your average "Tarzan" movie. What I mean is that, it is not an origin story but one where John Clayton/Tarzan (Alexander Skarsgard) who has left that part of his life behind him and is now in London where his family is originally from. Certain events come up where a King Leopold of Belgium is using Tarzan's previous home for mining of diamonds vai illegal slavery. To find proof of this and end his reign, George Washington Williams (Samuel L. Jackson) convinces Tarzan to head back to his home to help them out. Jane Clayton (Margot Robbie) is ecstatic about the news, because she loved the people there and wants to go back to visit. John of course doesn't want her to go because it is not safe, but she knows the dangers and fears nothing. She is not the Jane in Disney's Tarzan where she is a damsel in distress but is much more courageous. The Antagonist of the film is Leon Rom (Christoph Waltz), he is the mastermind behind everything and provides to be a worthy adversary. He takes Jane as a hostage and though he thinks it's a way to lure out Tarzan, she knows very well it is not a great idea. This movie was different and sometimes different works. Sure I wanted an origin story type of movie but the film showed flashbacks of John's childhood, so it wasn't too bad at all. I would have to say the CGI was okay. Compared to the Jungle Book which was great this was good. But knowing that detail the movie still didn't falter. The story was good and the whole cast did superb. 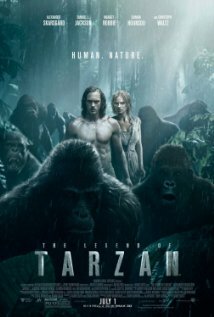 The Legend of Tarzan is a movie not to miss out on and if you are a fan of Disney's Tarzan, I'm sure you'll walk out liking this one, even if it's a little different.